!! !Last Minute Discount 9-12 April, 50,- Night!!! The sunny and quiet holiday apartment (elevator in the building!) 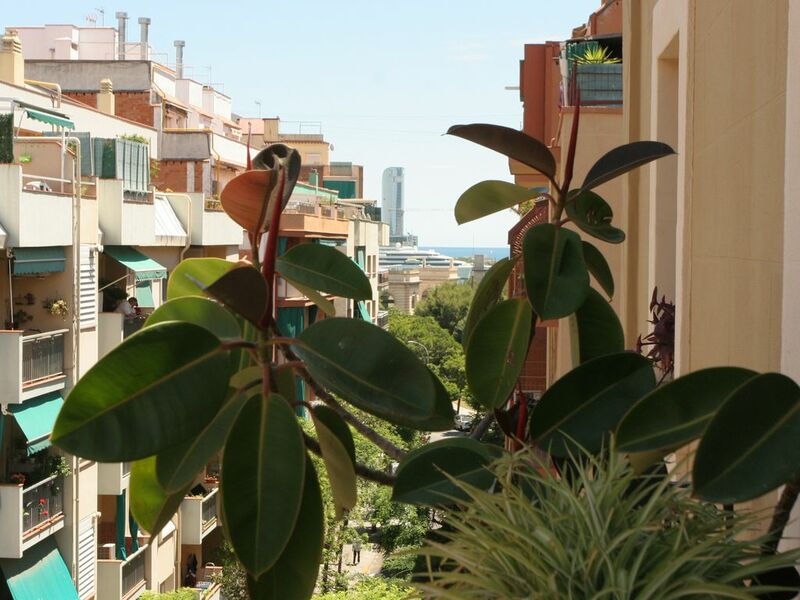 is situated in the secure and tranquil environment of Montjuïc; at the traditional Poble Sec Barrio. Poble Sec is very pleasant and not swarmed with tourists, but it's just a 5 minute walk to Las Ramblas. In around the house are numerous supermarkets, bakeries and delicatessens, as well as renowned restaurants and tapas Bars. Special tip: Pedestrian zone Carrer de Blai, also known as "Petita Rambla de Poble Sec". It has a large range of bars, ice salons, cafeterias and restaurants with terraces. Las Ramblas (L3 Drassanes, 1 stop). We hope that this information is of use to you. If you have any further questions, please don't hesitate to contact us. The apartment is equipped with - the house has a lift: Intercom, internet (WiFi), balcony, ceiling fans and central heating in every room, kitchen with refrigerator, oven, dishwasher, washing machine, living room + table for 4, Flat-TV, Double Sofa, 2 TV chairs, 1 large bedroom (+ large double bed - king size, sofabed, wardrobe, table, balcony), 1 smaller bedroom (+ 2 single beds) and bathroom plus WC. On your arrival you will find clean bed linen and towels for each person. Babycot and high chair for small children available. This apartment is extremely convenient for exploring Barcelona. There is easy access to the main tourist spots. Although there are plenty of supermarkets, cafes and restaurants within a very short walk it is a nice, quiet area. There is one large bedroom with a double bed and a smaller one with twin beds. The lounge area is spacious. There is a shower/bathroom and a small but well equipped kitchen. The hosts are kind, well informed and very helpful. They respond very quickly when help or information is needed. I can happily recommend this property. Wir möchten DANKE sagen!!!! Er waren unvergessliche Tage in dieser pulsierenden Stadt mit einer wunderbaren Unterkunft inmitten einer multikulturellen Umgebung im ruhigen Poble Sec Viertel. Wir haben uns unendlich wohl gefühlt und hoffe, dass auch Eurerseits soweit alles in Ordnung ist/war. Die Schlüsselübergabe hat sehr gut geklappt und wir waren bestimmt nicht das letzte Mal in Barcelona. Werden die Unterkunft selbstverständlich weiter empfehlen!!!! Loved the area, and the apartment; great landlords! The apartment was very comfortable and well equipped. The area was close to everything but unlike the historical center, "trañquilo". There is a "mini ramblas" a few blocks away with many wonderful tapas bars. The landlords left us cava, coffee, torrone, and other lovely goodies. The tiny kitchen has everything you could need, Nespresso machine, oven, stovetop. Microwave, dishwasher and washing machine. We'd go back in a heartbeat! Thank you Chris and Eduardo! We really appreciate your nice comment - that feels good:-) Hope to see you again next year...Saludos cordiales!!! Realmente disfrutamos nuestra estancia en este bonito apartamento. wir sind wieder gut in Hamburg gelandet. Danke für die schöne Wohnung und die tolle zentrale Lage. Wir haben uns sehr wohl gefühlt. Danke für die Tipps. Gern werden wir euch weiterempfehlen!!! Vielen Dank! Hasta la proxima!!! Nachdem meine Familie und ich wieder im Alltag angekommen sind, möchte ich es nicht versäumen mich zu bedanken. Nicht nur das alle Absprachen und Informationen problemlos per Mail in Vorfeld getroffen werden konnten und das das Appartment wirklich so schön war wie es beschrieben wurde, nein auch die reibungslose Übergabe der Wohnung und die überaus freundliche und sympathische Art haben den Aufenthalt in Barcelona von Anfang an zu einem schönen und angenehmen Erlebnis gemacht. Hola nach Bonn, liebe Mica. Danke eine weitere Reservierung...wir freuen uns natürlich besonders, wenn Gäste wieder kommen. Ich hoffe, es klappt auch nächstes Jahr wieder. Vorab ein schönes Weihnachtsfest und guten Rutsch!! Barcelona is a cosmopolitan city that has a special and unique charm. People who live in Barcelona become part of its activity and movement; and with this they offer a very diverse atmosphere, where culture, communication and entertainment are a part of everyday life. Those who love the arts may enjoy Picasso, Miró and the marvellous buildings created by Gaudí. The famous 'Las Ramblas'; a street 2 km long, that starts at the 'Plaza de Cataluña' and runs all the way down to the sea; is the best place to experience the spirit of the city. Between this square and the sea is the old part of the city, which consists of two neighbourhoods, or “Barrios”; 'Barrio Viejo' and 'Barrio Gótico'. Around Barcelona you have the opportunity to relax on one of the delightful beaches of the 'Costa Brava' and 'Costa Dorada. Because of this and many other reasons, coming to Barcelona to study, work or holiday is a real pleasure. Explore Barcelona and feel its exciting atmosphere.